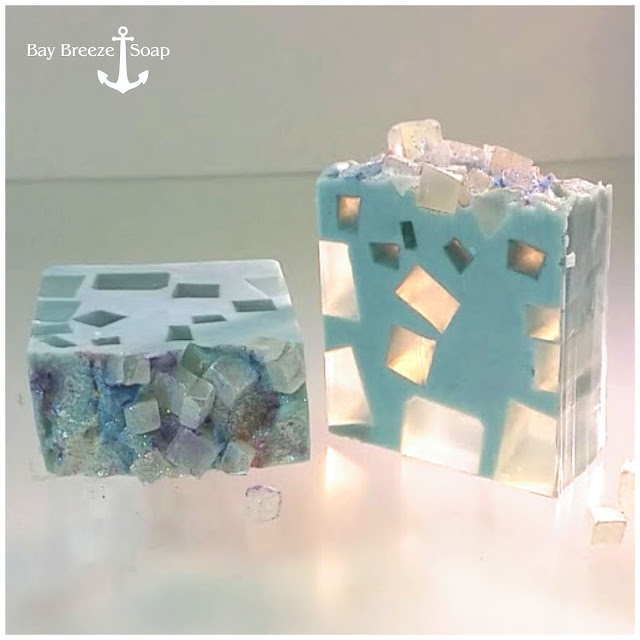 Iridescent sparkle and crystal clear ice in a cute soap. Blue, pink & lavender highlights on little tiny ice cubes. They look like ice in the moonlight. 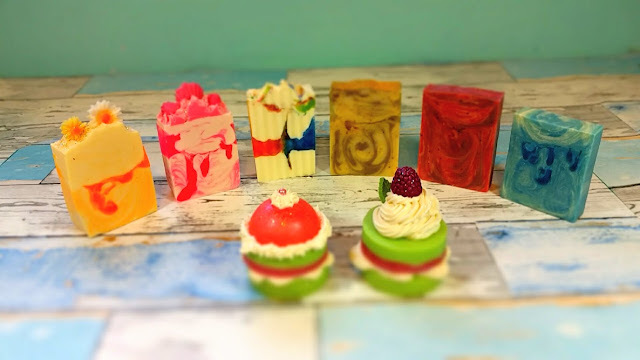 This month the Great Soapcakes Challenge is all about fun! Soap makers love (well this one does) to mix their melt and pour doo dads into cold process soap. I've had a ball playing around with lots of different techniques! I've done the several kinds of Magma Mix and MP Embeds. Only one soap can be entered and I choose Moonlight Ice because of the extreme satisfaction I had with making and simply looking at it. I could have gone crazy with color (and I did try that on a different soap) but in the end I wanted a cool elegance and crystal clear windows. I got a thumbs up from my husband too. He way prefers standard cut soap over the fancy stuff. These are the soaps I made in the CP & MP style practicing for the challenge to start. The crab based soaps are actually made with a small amount of Old Bay Seasoning. The blue one is destined to the Concord Point Lighthouse Museum gift shop.